The linear imager Gryphon I GM4100 extends Datalogic’s premium line with a high-performance wireless version. 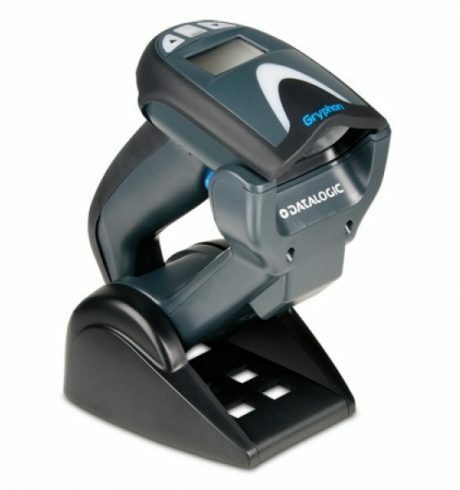 This robust handheld scanner is especially suited for applications in retail and light industry, as it offers unlimited mobility and guarantees efficient and productive barcode scanning. Equipped with the same scanning specifications as the wired Gryphon I, the M version transmits scanned data at 433 MHz. The integrated memory saves up to 1,200 codes, even when used out of communication range. In addition to simple point-to-point applications, the GM4100 is also capable of complex network operations. The patented 2-position stand is a hands-free station and charger in one. Using its integrated lithium-ion battery, scan up to 50,000 codes per charge. In order to increase mobile scanning efficiency even further, an optional version with display and a keypad with three keys is available, to use for active host communication.